Off the back of his performance at New York’s Electric Zoo festival, Tiësto recently announced the addition of Quintino as a special guest on select dates of his upcoming “Club Life College Invasion Tour.” With less than one month until the launch of the tour Tiësto has released a brand new video with live footage featuring Bingo Players, Dada Life, Quintino, Tommy Trash and of course, the man himself. 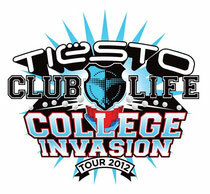 The 2012 installment of “Tiësto's Club Life College Invasion Tour” commences on October 2 in Syracuse, NY and winds its way through the Northeast and Midwest before hitting the South West and West Coast markets at the end of October. Aspiring DJs will have the chance to win their very own show on Tiësto's Club Life Radio, one of SiriusXM’s commercial free electronic dance music channels. Check out tiestouniversity.com/ for tickets and more info on the tour.